In Vietnam’s rural regions, local homesteads are constantly facing threats of natural disasters like flooding and soil erosion. An architecture firm has recently devised an affordable housing project that could potentially help downtrodden victims get back on their feet quickly. 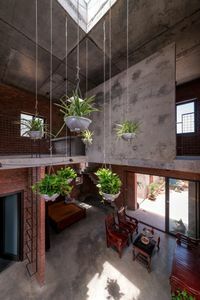 The project, titled AgriNesture, is the brainchild of Hanoi-based H&P Architects, which was founded by architect friends Doan Thanh Ha and Tran Ngoc Phuong. AgriNesture is a portmanteau of “agriculture” and “nest” because it seeks to integrate elements of agriculture into housing projects. 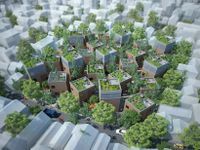 According to H&P, the idea came from the devastating effects of unplanned urbanization on Vietnam’s vulnerable areas, which can also bring about a loss in farming land. The firm recently finished a sample house in the AgriNesture project in Mao Khe Town, a low-income area in Quang Ninh Province with accelerated rates of industrialization and urbanization. 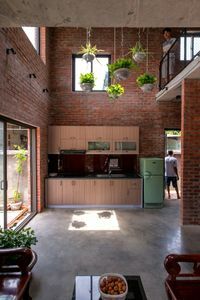 The house, whose total area is 75 square meters, is a two-story cube with bare brick walls, suitable for a family of four. A standard AgriNesture costs only VND150 million to build and VND200 million to furnish, a total of VND350 million. Apart from living areas, it also features a chicken coop and a garden. 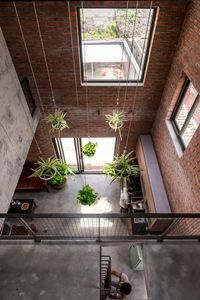 The rooftop is modified to hold a patch of soil for growing crops and optimized to collect rainwater for household use. H&P hopes to scale up AgriNesture to an entire community in which some houses could contain medical, education and other services. The space in between the houses are public space. H&P Architects have made headlines in the past with its innovative design that focuses on sustainable local materials and a sense of community. 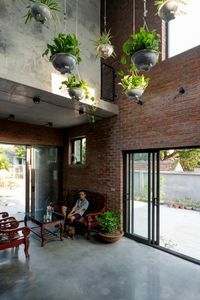 These include the award-winning “BE Friendly” community center that’s also based in Mao Khe Town.